Magnesium is becoming an increasingly popular supplement, taken by thousands around the world. I purchased a popular brand, Natural Calm, to try it out. Initially, I brushed it off as another fad, but after a close friend with similar struggles began taking it and experienced a dramatic difference in her health and well-being, I decided to take another look. Over the last decade or so, I’ve slowly transformed my eating habits, eliminating gluten and pretty much all processed foods, focusing on whole, organic foods instead, in addition to getting regular exercise. But, I have continued to suffer from occasional, and sometimes more frequent, bouts of anxiety and insomnia. I refuse to take a pill unless absolutely necessary, as the side effects are often worse than the problem itself. But, I have tried natural remedies like valerian and melatonin with mixed results. Digging into Natural Calm further, I became more and more curious. I learned that many people are deficient in magnesium today, with some reports estimating that as many as 80 percent of us aren’t getting enough of it, and few realize that the deficiency is the root of at least some of their health problems. Only 25 percent of American adults are said to be getting the recommended daily amount: 400 to 420 milligrams for men, and 310 to 320 milligrams for women, yet this macro-mineral is something required by every organ in the body. It makes sense that when you don’t get enough, you’re going to suffer one way or another. And, not surprisingly, two of the symptoms of a lack of magnesium, I learned, are anxiety and insomnia. In fact, they’re two of the most common symptoms of a magnesium deficiency. Still, I eat healthily and avoid processed foods, so why would I be lacking this nutrient? I dug even further and found that even those of us who follow a nutritious diet may be deficient because of modern farming practices that result in less nutrient-rich foods, as well as factors like stress and drinking a lot of caffeinated beverages. Boom. That really hit the nail on the head. Magnesium helps your brain relax so that you can fall asleep and stay asleep. It also plays a key role in the central nervous system, so without enough, anxiety and insomnia can result. That was enough for me – I decided to try it with the goal to give it a week and see if there were any noticeable changes. Natural Calm recommends that you start with a half teaspoon and slowly increase from there because, if you get too much, it can result in loose stools, which is actually one of the reasons some people take it (i.e., to cure constipation issues). But that wasn’t my problem, so I began with the half teaspoon, taken just before bedtime. The brand I used is an ionic form of magnesium, which improves its bioavailability. It comes in powder form and is dissolved in hot water. 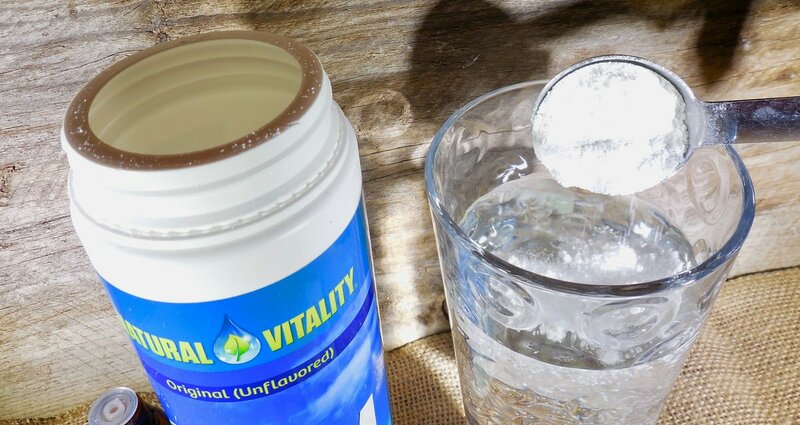 I watched the powder react to the water, forming a fizzy solution as I read Natural Vitality’s brochure on the product. Basically, it’s easier for the body to absorb due to its liquid form and, therefore, more beneficial than taking magnesium by pill or capsule. Okay, but will it actually work, or is this just marketing hype? The body needs to rebuild its magnesium levels and can only absorb so much of any nutrient at one time. So, depending on the level of deficiency, it can take a while to build levels back up to a point where symptoms begin to noticeably diminish. That said, I didn’t expect to notice results overnight. The higher quality the supplement, the quicker it works (so I’ve been told), but I still wasn’t sure what that timeline would be for me. Day 1: I took my first half-teaspoon on Sunday night in a glass of water and with a squeeze of lemon and laid there waiting for it to knock me out like Ambien, despite consciously knowing that was not going to happen. Needless to say, I didn’t really notice much of a difference in how well I slept, although it wasn’t one of my worst nights either – I got six hours of sleep. Could I credit that to the magnesium or was it psychological? Day 2: I noticed that during the day I felt more calm than usual – until I got a huge, unexpected bill in the mail, that is. Of course, there are few people, no matter how level-headed and calm, that would breeze through the afternoon relaxed and happy after that. Still, that night, despite the added stress, I slept better than I had in quite a while, managing to get about seven hours of sleep. Definite progress. As I wasn’t experiencing any negative side effects, I decided to increase my dosage to a teaspoon. Day 3: After a good night’s sleep, I woke up with a more positive attitude, took a few deep breaths and decided to have a better day. And I did. I felt much more in control of my emotions. When I encountered a rather rude clerk at the store, instead of allowing her to get the best of me, I actually managed to say, “I hope your day gets better,” rather than letting the incident spiral me into anxiety, which is what often happens. Day 4: I’m continuing to sleep incredibly well and today, while I didn’t experience any kind of stressful event, I felt relaxed, calm and virtually anxiety-free. Day 5: I have so much more energy now that I’m actually getting some quality shut-eye every night, and I noticed that my annoying co-worker who is always talking loudly to herself and popping her gum wasn’t really bothering me anymore. Day 6: My anxiety level has significantly dropped. Last night, I even managed to get a little more than eight hours of sleep. Day 7: Needless to say, my experiment produced positive results. I’m actually going to up my dosage to the recommended amount of two teaspoons a day. First, you’ll need a water-soluble magnesium supplement. I’d suggest starting with a small dose of half a teaspoon diluted in hot water. (Hot water speeds up the chemical reaction needed to bind the magnesium carbonate and citric acid together to form magnesium citrate). Once the fizzing stops, your magnesium drink is ready to be consumed. You may want to add a squeeze of lemon for flavor if you’re using the unflavored variety. Read Next: Can Drinking Gin and Tonics Actually Help Reduce Hay Fever?